Lorne Varga addresses delegates as the new president. 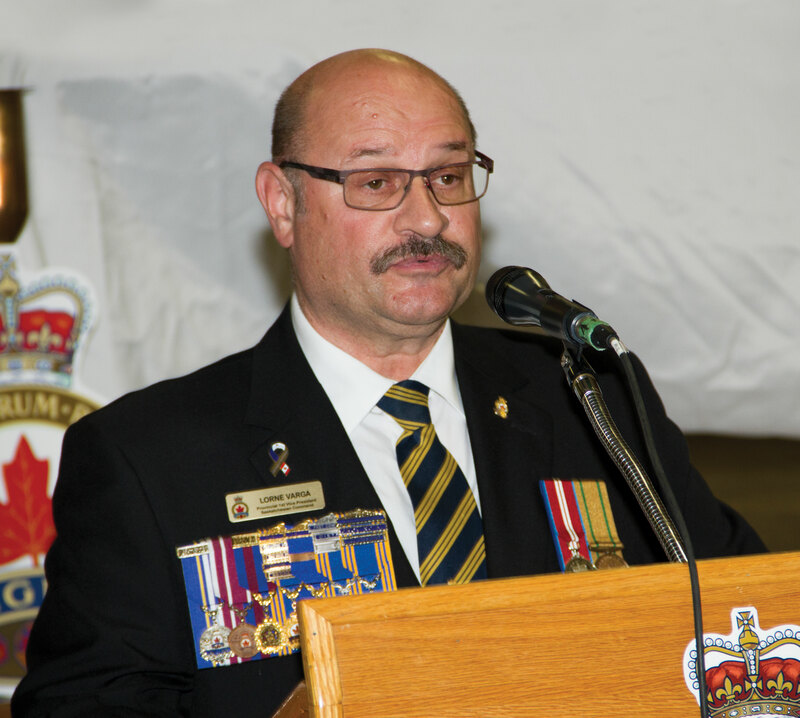 Saskatchewan Command announced a new partnership it has formed to offer a peer-support program for veterans and first responders suffering from operational stress injuries (OSIs) during its 49th convention held Oct. 14-16 in Estevan. OSI-Can is a partnership between Saskatchewan Command and the Canadian Mental Health Association, Saskatchewan Division. Provincial Co-ordinator Julius Brown told delegates that those suffering from an OSI need only open one door to have access to a number of programs. OSI-Can provides a secure and confidential forum where participants can discuss their issues with others who are going through the same thing. It also provides access to service providers offering housing, counselling, vocational training, psychosocial rehabilitation, advice on prescriptions, service dogs and equine-assisted therapy. The convention was held at Estevan Branch, which has a series of adjacent buildings providing the main meeting hall with smaller rooms and the clubhouse. Located 200 kilometres southeast of Regina, Estevan is the farthest south the Saskatchewan Command convention has been held. Activities began on a sunny but cold afternoon with a parade from the branch to the cenotaph located by the town courthouse. Wreaths were placed by local dignitaries including acting director general Maryse Savoie of Veterans Affairs Canada, Dominion Past President Tom Eagles and Saskatchewan Command President Ken Box. 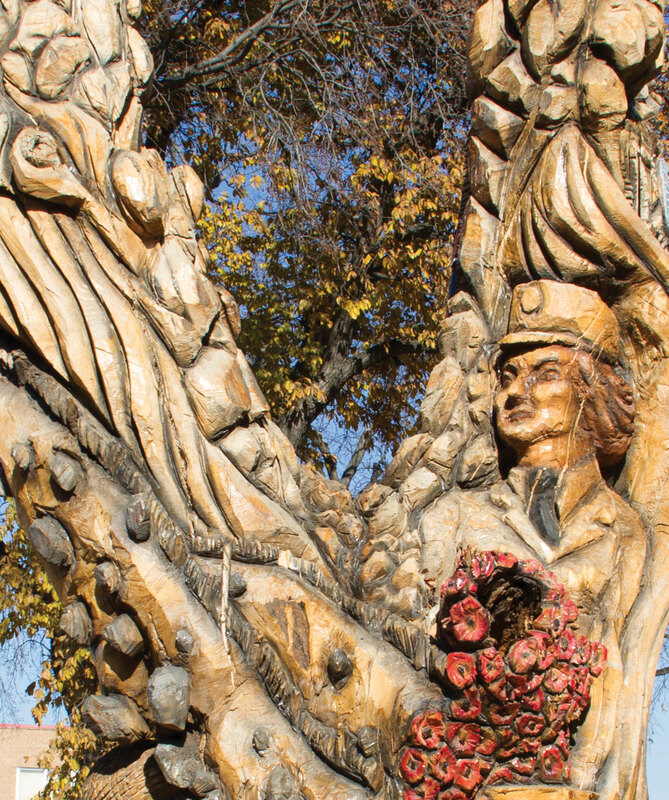 The ceremony took place beside the Estevan Soldiers’ Tree, a local attraction featuring images of Canada’s military that led to victory in the Second World War, carved out of the trunk of a 100-year-old cottonwood tree. Stephen said that PTSD affects people of every age, rank and gender. “The good news is that for some the symptoms disappear over the years, but for others they continue,” he said. The business session began the next day with 128 delegates in attendance. The Estevan Soldiers’ Tree stands by the town cenotaph. Eagles brought greetings from Dominion Command. “Younger veterans are not joining the Legion in the numbers we would like,” he said, discussing new membership initiatives. 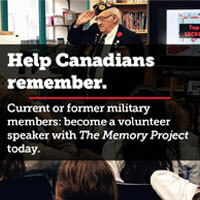 “In a survey, 3.5 million Canadians said they would join the Legion if they were contacted. That is what we are trying to do. “When we are criticized, we don’t act like a groundhog—or prairie dog, as you would call them in Saskatchewan—and scurry back down our hole. We stand and use it as a springboard to tell our story,” he added. Eagles also briefed delegates on the work The Royal Canadian Legion is doing in the Caribbean on behalf of the Royal Commonwealth Ex-Services League (RCEL). Cheques were collected and buckets passed, bringing in $7,700 for the RCEL. Former dominion president Pat Varga gave a report on the provincial command’s Leave the Streets Behind Program. She noted that since November 2015, the command has assisted veterans with funding totalling $22,923. “I believe we are truly fortunate in Saskatchewan to have such little need to assist homeless and near homeless veterans, but thanks to members and branches continuing their most generous support, we can support them when it becomes necessary,” she said. Varga also reported on the Discovering the Power of Me program, which Saskatchewan Command launched in 2013. This program provides a safe place to hold seminars and lunches. The program has had 54 participants who self-identified as veterans, currently serving military, RCMP and family members. As well, there have been 12 participants who self-identified as police, firefighters, corrections workers, first responders, service officers or survivors. Dwane Burke of Star City Branch gave a presentation on his experiences as the delegate for Saskatchewan Command on the 2017 Royal Canadian Legion Pilgrimage of Remembrance to Europe. He had been assigned to research and speak about William Thomson of Saskatchewan, who was killed during the First World War. Burke gave a short speech to the delegation when they found Thomson’s grave at the Canadian Cemetery No. 2 at Neuville-St. Vaast in the park surrounding the Canadian National Vimy Memorial. “To be there is pretty intense,” he said. Resolutions went smoothly, with delegates voting to award crests to the winners of command-level sporting events and to expand the poster and literary contests to include a video contest to encourage students to use modern technology creatively to honour those who have served. The only stand-up vote required was on a resolution under the Leadership Committee Report. The resolution noted that the Legion’s shift to a paperless environment had placed a burden on small branches that are struggling financially. The concurred resolution called upon the provincial command to develop a Master Manual to be issued to each branch in which pages can be replaced as rules are amended. Zone and deputy zone commanders could verify the accuracy of the manual during their branch visits. 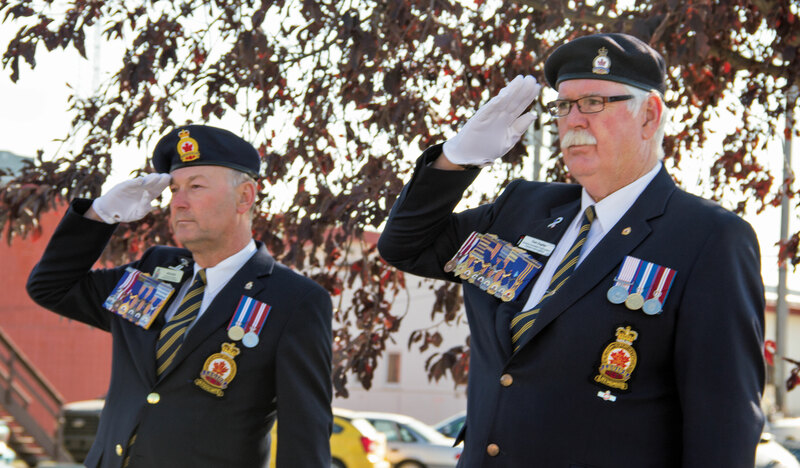 Saskatchewan Command President Ken Box (left) and Dominion Past President Tom Eagles salute the colours during the parade. While some delegates said that the resolution would require more work by the branches, others spoke in favour. After calling for a voice vote, Chairman Ray Marjoram decided delegates would have to stand. The resolution was carried. In elections, First Vice Lorne Varga of Coleville Branch was acclaimed as president. Both vice-presidents, Allan Hodgson of Nipawin Branch and Keith Andrews of Beechy Branch, ran for first vice, with Andrews winning. Hodgson declined to run for re-election as a vice-president. Six others ran for the two positions of vice-president, Roberta Taylor of Oxbow Branch, Al Hemingway of Lloydminster Branch, Wayne Shepherd of Whitewood Branch, Jim Woodward of Kamsack Branch, Les Trayhorne of Elrose Branch and Carol Pedersen of Star City Branch. Taylor and Pedersen were elected. Woodward also challenged Chairman Ray Marjoram of North Battleford Branch, with Marjoram receiving another term. Varga said he was very honoured to be elected president and thanked the Local Arrangements Committee for its work. “Veterans need our help in different ways these days,” said Varga. “Sometimes it is financial, or they need a job or a roof over their head. Sometimes it’s just to talk to someone. We’re there for them,” he said.